It’s a game-changer for offenses as pressure coming through the center or either guard is the quickest way to the quarterback. 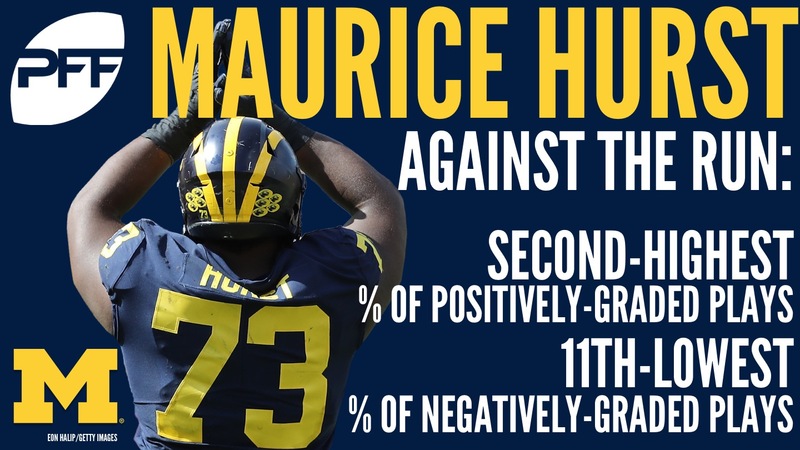 There’s no better interior disruptor in the 2018 NFL Draft class than Michigan’s Maurice Hurst, and his three-year production makes him no worse than a top-10 pick come late April. Of course the top of the draft will be dominated by quarterbacks, but Hurst’s track record of success is too difficult to ignore, and in a class that lacks dominant interior pass-rushers, Hurst’s value should be even higher. Unable to work out at the NFL Combine due to an EKG scare, Hurst was cleared and able to work out at Michigan’s Pro Day. All heart scares aside, Hurst’s production matches up well with previous defensive linemen who posted top-notch PFF grades in college and have gone on to excellent starts to their careers at the NFL level. If anything, Hurst has outplayed previous college-to-NFL conversions, and his down-to-down production should be the most important part of his evaluation when projecting him forward to the next level. Hurst was a part of an outstanding Michigan defensive line in 2015 and 2016, and their deep defensive line rotation held him to only 760 total snaps over the two years. 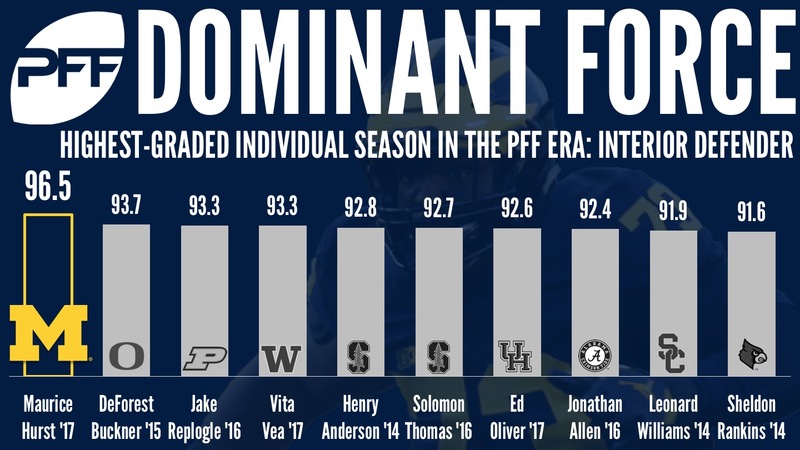 The Wolverines were rolling seven deep in productive defensive linemen and future NFL talents, but Hurst was the most productive player on the line on a snap-for-snap basis. The PFF grading pointed toward a dominant 2017 season for Hurst if given an expanded role and that’s exactly what he delivered. He posted a 96.5 overall grade, the best we’ve seen from an interior defensive lineman in four years of grading, on a career-high 643 snaps. He essentially took his 2015 and 2016 production and combined it into one year’s worth of dominance, while actually making a few more big plays on a snap-for-snap basis. OK, let’s get back to some Maurice Hurst fun. That gives us is three years of unprecedented production from Hurst who has now outperformed other players with similarly-dominant performances in college, including DeForest Bucker of Oregon, Grady Jarrett of Clemson, Leonard Williams of USC and Jonathan Allen of Alabama. Given the early success of the aforementioned players, Hurst looks like an early contributor at the next level. There may be some teams who still question the size of their interior defensive linemen and Hurst coming in at 6-foot-1, 292-pounds may be a red flag for teams with antiquated thresholds. If anything players such as Jarrett, and of course the NFL’s best player, Aaron Donald, have done their best to lay waste to old size thresholds, and Hurst’s build should not be an issue if looking for a classic 3-technique disruptor. There are three basic ways to make an impact as a run defender: defeating blocks, finishing plays in the form of “stops” (tackles for short gains and resulting in keeping the offensive “off schedule”) and not getting knocked out of your gap by blockers. Hurst is strong in all three areas. He fires off the ball with low pad level, either shooting gaps or knocking blockers backwards into the backfield. Last season, Hurst posted the second-highest percentage of positively-graded plays against the run and he’s ranked in the top 15 in run-stop percentage in each of the last two seasons. That combination of blowing up blockers and finishing plays bodes well for the next level. He’s also rarely moved off his spot as he posted the 11th-lowest percentage of negatively-graded plays against the run last season out of 288 qualifying defensive tackles. Hurst has the disruption, big plays and gap control you’re looking for in an interior run defender. When it comes to pass-rushing, it may look like Hurst had a breakout season with his eight sacks in 2017 after coming into the year with only seven in his career, but as the PFF Analytics team has pointed out numerous times, pressure totals and pass-rush grade are better ways to determine future sack totals. Using that knowledge, Hurst’s dominant pass-rush grades in 2015 and 2016 meant that his 2017 “breakout” was inevitable. It wasn’t really a breakout for Hurst, but rather a continuation of his usual disruptive play and his three years of strong pass-rush grades should translate directly to the NFL. We now have four years of PFF College data and three years of players converting to the NFL, and pass-rush grades have shown to have an extremely high correlation when predicting NFL pass-rush performance. On the field, Hurst has shown capable of winning blocks up front with his get-off, pad level and quick hands, and from an analytical perspective, his college production was at a high enough level to further increase the confidence that he’ll be an effective player at the next level. Hurst too quick off the snap. Assuming most of the NFL has moved on from being intimidated by a defensive tackle standing “only” 6-foot-1 and weighing under 300-pounds, Hurst should hear his name called in the top-10 of the draft. With 4-3 and 3-4 schemes blending together even more on an annual basis and every team in the league needing some kind of interior pass-rush presence, Hurst has potential value for any of the 32 teams. His get-off, pad level and motor all led to his making more plays on a snap-for-snap basis than any defensive lineman in college football over the last four years, and there’s no reason to believe he won’t be able to carry over similar success to the NFL. With only four years of data under our belt at PFF, we’re starting to find the proper trends when it comes to college to NFL conversion and defensive linemen posting high-end PFF grades in college have translated extremely well to the NFL in the early going. Hurst should be the next player to translate and he warrants one of the top picks in the draft.